A Blue Belt tuna tagging programme is taking place in St Helena as part of a wider project tagging 120,000 tropical tuna species from across the Atlantic. Fishing is not just an important local industry in St Helena – it’s a part of the island’s culture. 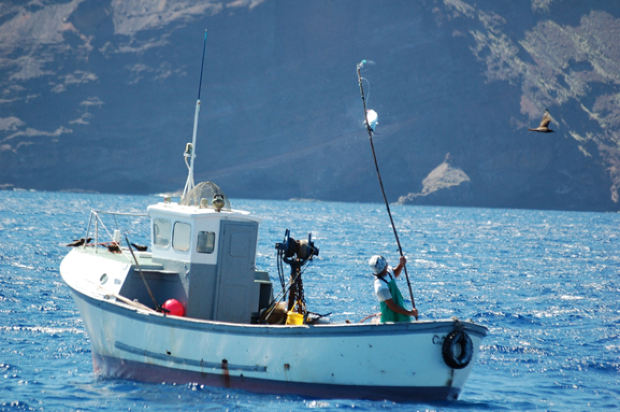 For decades, several species have been commercially caught within St Helena waters including yellowfin, bigeye, skipjack and albacore tuna and wahoo. To better understand both local and global tuna stocks, a tuna tagging programme was established on the island in 2015 as part of a Darwin Plus Project. The UK Government-funded Blue Belt Programme has continued the work that was started and in 2018. Cefas and the St Helena Government (SHG) were also awarded additional funding from International Commission for the Conservation of Atlantic Tunas (ICCAT) to extend the programme. Working in collaboration with Stanford University, UK Government Blue Belt support is focused on the deployment of pop-up satellite and data storage tags. The ICCAT project is part of ICCAT’s Atlantic Ocean Tropical Tuna Tagging Project (AOTTP), which aims to tag 5,600 tuna in St Helena waters by June 2019. This project uses simple, numbered external tags and so far, over 2,400 tagged tuna have been released back into the island’s waters. Cefas’ Serena Wright with Calvin Clifford, Martin Cranfield, Peter Benjamin and Mark Beard tagging a yellowfin tuna on the FV Helena Dorothy in April 2018. 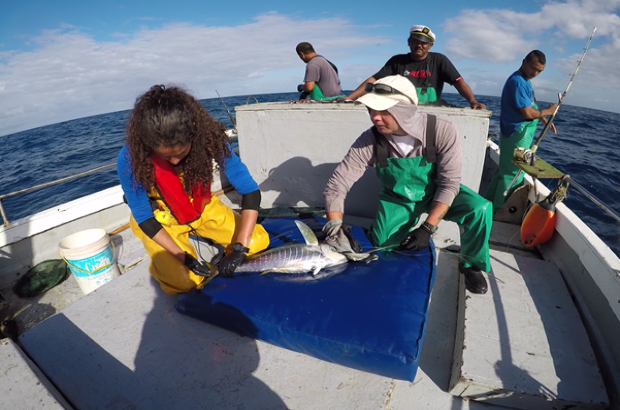 Cefas’ Serena Wright, who recently returned from a tagging trip in St Helena, explains, “we deploy a number of different types of tags and markers on the tuna within St Helena waters. Once the tuna are released, we rely on fishermen to return the tags to us so we can analyse the data. When data are received from electronic tags, the vertical behaviour of tuna can be explored, using inbuilt pressure, temperature and acceleration sensors”. Once all tuna have been tagged and released, the final phase of the programme will be to analyse the data returned from all over the Atlantic, including St Helena. Satellite and data storage tags will provide information about tuna movements and diving behaviour. Satellite tags pop-off at a pre-programmed time and send data back via a network of satellites. With data storage tags, the fish must be recaptured for the data to be collected. Recapture information from the simple external tags will be used to better understand both local and global tropical tuna stocks - estimating stock biomass, mortality rates and connectivity between regions. All data from St Helena is submitted to ICCAT to help better understand the tuna stocks. You can visit the AOTTP website for an update on releases and recaptures. Initial results from the satellite tags indicate that yellowfin tuna consistently make their deepest daily dives at sunrise and change their behaviour depending on the season. The yellowfin tuna spend most of their time in surface waters during summer and more of their time at depths greater than 200 m in winter. To date, the ICCAT project has tagged around 2,400 tuna, which is providing valuable data from a remote part of the Atlantic Ocean. The results should shed light on both local, and global, stocks of these important species of fish. This work would not be possible without the involvement and continued support from the St Helena Fishermen’s Association (SHFA) and the St Helena Fisheries Corporation (SHFC). Thank you to all the fishers involved in the release and recapture of fish from the programme, but also to the SHFC for supporting the return of data from this work. The Blue Belt Programme supports the delivery of the UK Government’s commitment to enhance marine protection of over four million square kilometres of marine environment across UK Overseas Territories. The programme is an innovative partnership between two world-leading agencies of the UK Government, the Centre for Environment, Fisheries and Aquaculture Science (Cefas) and the Marine Management Organisation (MMO).